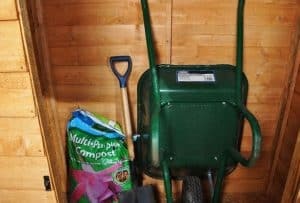 The Starter 5 X 3 Shed is a shed that is perfect for those who do not want to spend a ton of money on their garden storage. This shed is also rather compact in its size so it does not need a lot of space. 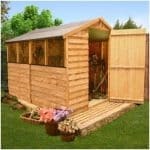 This makes it a very good shed for those who do not have a large garden. The shed has a very classic kind of charm to it. It has elevated eaves which give you that little bit extra headroom. This means you can stack some shelving or just general items that little bit higher. A good sized single door is right on the front of the shed and this makes getting items in and out very easy. While this shed is being sold for a very low price, they have made sure to use as good materials as they possible can. The overlap cladding will do a great job at keeping the rain out. This is supported with a very impressive frame that makes the shed a very strong structure. The roof and floor are both made with solid sheet boarding. The roof though is given that extra bit of support thanks to some thick roof battens. 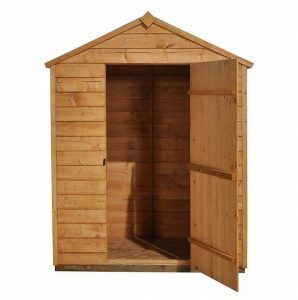 The Starter 5 X 3 Shed is the perfect shed for those without a ton of space and those who want something cheap, but reliable. 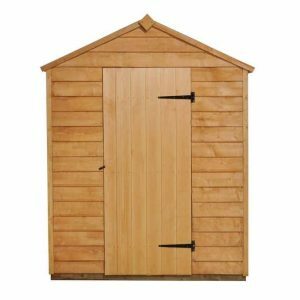 At just under £150 this classic and somewhat rustic looking shed has a lot of charm. It certainly has that classic shed look and we think in general it has a very nice style. The width of the shed is just a hair over 5 feet and the depth is 2 feet 11 inches. So this is not the kind of shed you will be breakdancing in, but this kind of space can go pretty far if you organise things well. The shed can have things stacked pretty high as it has elevated eaves which give you a little bit more height to play with. At its highest point the shed is 6 feet 4 inches tall which is quite impressive. The roof is made with 8 mm thick solid sheet boarding. This is the most basic kind of roof you can get, but at this price point it was the right design decision. The roof boards are supported with chunky roof battens so while the boarding may not be all that thick, the roof is actually much stronger than you would think. The apex design of the roof means that the rain is always going to run off at the sides and never the front of the shed. It is the 8 mm thick overlap cladding that gives the shed its rather rustic kind of look. We actually really like the way that this cladding looks and are sure it is going to be able to stand up to the elements incredibly well. We do feel that they maybe could have gone for 10 mm, but then they would have probably have to raise the price. The Starter 5 X 3 Shed is actually a very strong shed. This is down to the cladding and the 28 mm x 28 mm thick fame that is keeping it all together. This is exactly the kind of frame we expected to see in this shed and we feel it is perfect. The frame is strong, but it is not overly thick so it does not really eat into your storage space. For the floor they have used that same 8 mm thick solid sheet boarding. Now on a larger shed this may be a bit of an issue, but as this is a compact sized shed, chances are you are not actually going to be walking around or spending a ton of time inside so we think it will be ok. It will still be able to handle heavier items very well so do not worry about that. One thing you will have to do with your Starter 5 X 3 Shed before you use it is give it a good coating of wood treatment. This shed is dip treated which is only good for short term protection. We are talking about two weeks max. But even that is a bit long for us. We always suggest that you treat the shed soon after installation. To really keep the shed free from rot, you will need to give it a fresh coating once a year. As long as you treat the shed properly and take the right care of it, you will be protected by a ten year anti rot guarantee. If you do not treat the shed and then a couple of years down the line rot appears then you will not be covered. So please make sure you take proper care of the shed. Right in the middle of the Starter 5 X 3 Shed is a basic, but effective single door. The door is actually a very good size as it is 5 feet high and 2 feet 2 inches wide. This is more than enough room to get things like mowers and even bikes into the shed. The door is supported with three horizontal braces on the back and secure to the shed with two hinges. Look, we know that this is a budget priced shed, but we do feel they could have sprung for a third hinge to go in the middle. There are no windows on this shed, but at this price range that is exactly what we would have expected. As this is a rather compact sized shed, when you have the door open that will let in plenty of natural light so you can easily see what you are doing. So really, we do not see the lack of a window a big deal at all. While a solid and well made shed, there is not exactly a whole lot of security on offer here. The door is kept shut by a simple turn button catch. 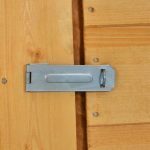 Now in our experience these work, even when it is really windy, but if you plan on keeping something expensive like a mower or even a bike in here, you will want to think about adding some extra security. As this shed is fully boarded, you do not have to worry about your weirdo neighbours looking over the fence and seeing all the cool stuff you have. If you want to customise the Starter 5 X 3 Shed then it is actually pretty easy to do. 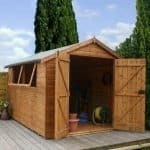 This is a shed that requires wood treatment, so before you get the standard, but effective, brown or clear like everyone else does, have a think about getting a coloured wood treatment. You can get blue, green, grey and may other colours. There is nothing wrong with classic brown, but if you want to kick things up a notch the coloured options are there. You do have a few extras to consider here. First of all is their installation service which at £109.99 is nearly as much as the actual shed, so we would stay away from that. 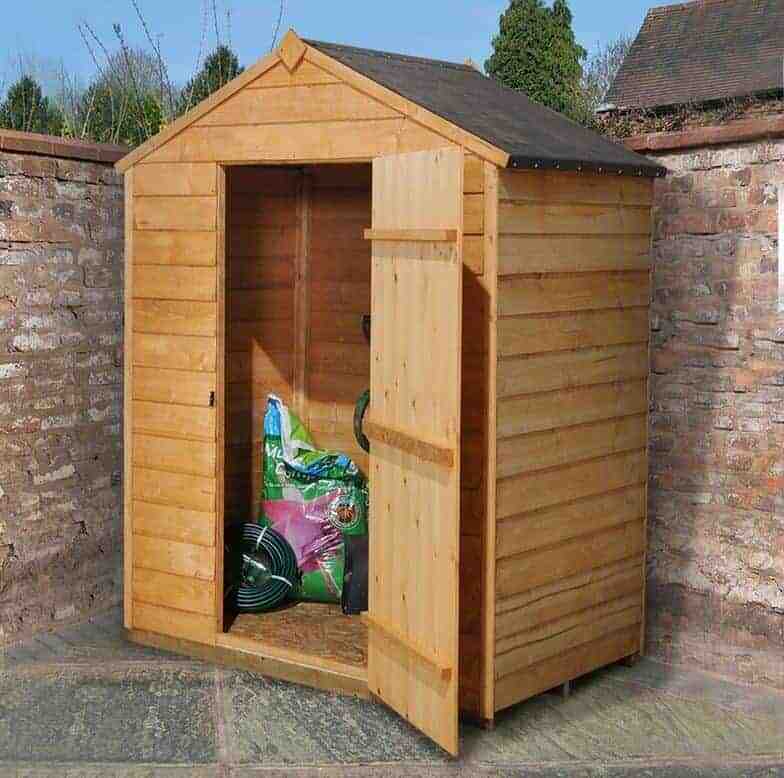 For £59.99 you can add a very strong and well designed shed base. 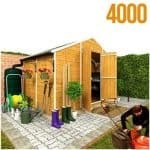 This is something to consider if you are not too sure about the area you are installing your shed on. You will need to add some kind of security to the shed and for £12.99, you can add a padlock that comes with an alarm. 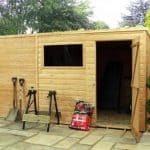 This is a budget priced shed so you have to keep that in mind, but we do feel that at this price range they have gone out of their way to use the best materials they could without raising the price. This is a shed that if looked after right is going to give you a lifetime of use. This is a little on the small size, but that is part of its appeal. Plus the extra height that it offers means that you can use shelving and stack things a little bit higher, which will help free up some floor space. This is a pretty straightforward installation job. You will need another person to help you out, but there really is not a whole lot to this. Just follow the instructions and use your common sense and you will be done in no time at all. 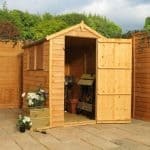 The £149.99 makes this one very appealing shed. We feel that the asking price is fantastic and probably the lowest they could actually offer this shed. 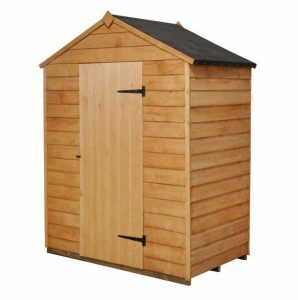 Final Thoughts: The Starter 5 X 3 Shed is a shed that really has impressed us. 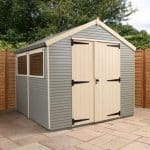 Sure it may not be the most high quality shed we have seen, but there is a market for compact sized and low priced sheds and we feel that this is one of the best in that category. The materials while not the fanciest will get the job done and if you look after the shed right, then you will find that it will give you many, many years of use. It really is great value for money and we must say that we actually think the overlap cladding they have used really does give it something of an old school charm.